After the easy ride against Sri Lanka in the one-day international and Test series at home, Team dia is set to face a litmus test when they take on Pakistan in a demanding three-Test and five ODI series. Private sports broadcaster Zee Sports said on Thursday it was ready to share feed with public broadcaster Prasar Bharati if it got BCCI’s cricket telecast rights, a position contrary to other players like ESPN-Star Sports and Ten Sports both of whom have gone to court in protest. Sania Mirza reacts during her match against Venus Williams of the USA at the Champions Challenge in Hong Kong on Thursday. Rain hit South Africa’s hopes of squaring their series with Australia after only 20 overs of play were possible on the fourth day of the third cricket Test at the Sydney Cricket Ground today. The efforts of Andhra skipper Venugopala Rao (78) and MSK Prasad (72) were not enough to prevent Punjab from taking a first innings lead of 79 runs on the penultimate day of Elite B Group Ranji Trophy cricket match being played here today. Wimbledon champion Venus Williams overcame an injury scare to down Indian sensation Sania Mirza 6-3, 6-3 in the Champions Challenge here today. Four-time Australian Open champion Andre Agassi succumbed to a long-standing ankle injury and officially withdrew from the first Grand Slam event of the year, his management company said today. Martina Hingis continued her successful comeback to competitive tennis, though she dropped her first set, when she advanced to the semifinals of the Australian hardcourt championships today. Top seed Croatian Ivan Ljubicic survived yet another scare before prevailing over Jiri Vanek of the Czech Republic to enter the quarterfinals, while sixth seed Rainer Schuettler of Germany crashed out of the Chennai Open ATP Tennis Tournament here tonight. Continuing with her winning spree, favourite and fourth seed Sanaa Bhambri and Rupesh Roy entered the girls and boys singles final, respectively, in the Sunny Enclave ITF Junior (Grade-3) Tennis Tournament at the CLTA Complex in here today. Credible performance by goalkeeper Adrian D’Souza and defender Vikram Pillai enabled Indian Airlines overpower IOC 5-4 in sudden death stage in the final of the 22nd Indian Oil Surjit Hockey Tournament. 2-1 win over defending champions Hyderabad Sultans in a Tier-I match of the PHL played at the floodlit Sector 42 Hockey Stadium today. A Maratha Warriors’ player in action during the first match of the PHL (Tier-I) against Hyderabad Sultans at the Sector 42 Hockey Stadium in Chandigarh on Thursday. Warriors’ won 2-1. The 30th All-India Liberals Hockey Tournament kicked off in style amidst a colourful opening ceremony at the Ripudaman College ground here today. Punjab Police downed BSF 22-25, 25-17, 25-20, 25-22 to annex the title in the Punjab state volleyball championship which concluded at the Polo ground here today. After the easy ride against Sri Lanka in the one-day international and Test series at home, Team India is set to face a litmus test when they take on Pakistan in a demanding three-Test and five ODI series. Coach Greg Chappell felt that the players should utilise this tough series to bring out their best for the overall benefit of the “evolving” Indian team. Chappell equated the Indo-Pak cricket series to that of the Ashes tussle between England and Australia. He said though the supreme claim to fame for the Ashes series “is the history behind it”, the Indo-Pak cricket series scored over it in many other respects. “It is a great marquee series in world cricket. We need to be tested by difficult teams as Pakistan are a confident bunch,” Chappell said. He said India would have to raise the level of their game by a few notches to come up trumps in Pakistan. He expressed his happiness at the composition of the team, and the return of Zaheer Khan into the fold after his successful run in domestic cricket. The coach expected him to play a crucial role during the Pakistan series. He was not unduly worried about the failure of the openers to get big scores though he felt that it was desirable to get a “good start”. “It’s all about applying ourselves,” Chappell added, noting that the team management was yet to decide on who would open the innings in Test matches. “We have the option of having three openers,” but reiterated his resolve to continue with his experiment of promoting or demoting players in the batting order to have greater flexibility and option in the team, as well as to counter the strategy of the opponents, and keep them guessing. The former Australian captain said the Indo-Pak cricket series operated at a different level as “the enthusiasm, excitement and the sheer number of people involved in the series make it the biggest”. “I am honoured to be part of the series,” Chappell said, before Team India’s departure for Lahore for the 46-day long tour of Pakistan. Captain Rahul Dravid looked at the series with the same enthusiasm and the same respect he would show to any other series. He did not think that Pakistan, being the hosts, enjoyed any undue home advantage. According to him, past reputations made little sense as both the teams would “begin the series on zero”. Dravid said for him, every series was a challenge. “But the point is to enjoy our cricket. We have prepared for the series as best as we can,” he noted. Adding some mirth to his verbal sallies, Dravid said he did not feel that the upcoming series against Pakistan would be the toughest of challenges he would be encountering. “The toughest was, I think, to sing my baby to sleep,” he said. The captain has pleasant memories of Pakistan as the last time India toured the neighbouring country with much fanfare and publicity in 2003-2004, Dravid had deputed for Sourav Ganguly in the successful opening Test at Multan, and it was a great personal achievement for him as he had never visualised that he would travel this far when he made his international debut 10 years earlier. He sure wanted to be a “successful cricketer,” but a successful captain was farthest from his thoughts. Now that the tide has turned in his favour, Dravid was ready to “take added responsibilities” though his “principle and the philosophy” would remain the same, as of yore. The captain, virtually reading out the riot act, said he expected every player to give off his best, without being told so. “I should not have to tell a player to give his best for the country. It is given, it is understood that he has to give his best,” Dravid added. UNI adds: Though there was no message from the Prime Minister — like it happened last time — BCCI President Sharad Pawar today asked the Rahul Dravid-led cricket team to represent the country in Pakistan, besides announcing that he would be present there during the first Test match in Lahore. “The cricketers are going there not just as a team, only for the sake of the series. They are going there on behalf of entire India as our goodwill ambassador. I’m confident that they will earn a lot of goodwill there,” he added. 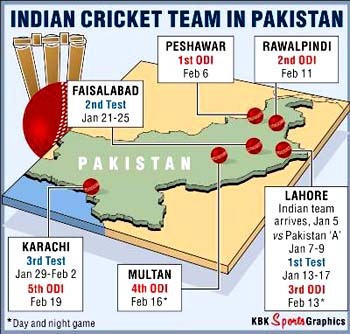 The Union Agriculture Minister also revealed that he would travel to Pakistan on January 13 when the first Test starts in Lahore. Last time Sourav Ganguly led a side to Pakistan, the then Prime Minister Atal Bihari Vajpayee had asked his side to win hearts as well besides matches. 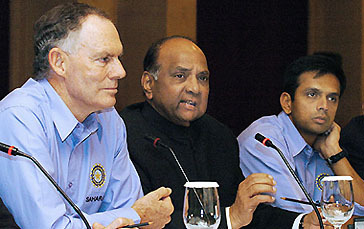 He also said that the new BCCI set up was infusing more professionalism and transparency in the running of the board. Private sports broadcaster Zee Sports said on Thursday it was ready to share feed with public broadcaster Prasar Bharati if it got BCCI’s cricket telecast rights, a position contrary to other players like ESPN-Star Sports and Ten Sports both of whom have gone to court in protest. “We are ready to share (the feed) with Prasar Bharati if we emerge successful in the bidding process,” Zee Sports Business Head Himanshu Modi said. The Proteas, who lost last week’s second Melbourne Test by 184 runs after the first match was drawn, advanced from an overnight four for one to 94 for three when rain washed out play after tea. South Africa have only a 186-run lead heading into tomorrow's fifth day and more showers are forecast, almost certainly condemning the match to a draw. In that eventuality, Australia will win the home series and renew Test hostilities in South Africa in another series next month. “We are in the hands of the weather. We just want to give ourselves the best chance of winning the game,” South African pace spearhead Shaun Pollock said. When play was abandoned for the day, first-innings centurions Jacques Kallis (14) and Ashwell Prince (0) were at the wicket. The Proteas lost the wickets of skipper Graeme Smith and Herschelle Gibbs today. Gibbs threw away his wicket when he was run out for 67 in a mix-up with Kallis over a quick single. He was beaten back to the non-striker's end by a direct throw from Brad Hodge. Gibbs, who scored 94 in the first innings of the second Test loss, had boosted the Proteas’ run-rate striking 11 boundaries in his lively 74-ball knock. Shortly afterwards rain sent the players from the field for an early tea and there was no further play. Smith had been offered the bad light by the umpires after just four balls of the day’s play, but chose to bat on. He paid the price three balls later when he was out for five. Smith played across the line from Glenn McGrath and was hit high above the knee-roll but was given out by umpire Aleem Dar, in another questionable leg before wicket decision by the Pakistani match official. Dar controversially turned down two big lbw appeals against Mike Hussey and Ricky Ponting yesterday. The dismissal completed a disappointing series for Smith, who has had scores of 34, 30, 22, 25, 39 and five. It left the South Africans on six for two, but Gibbs and Kallis steadied the innings with a 86-run partnership in 91 minutes. Gibbs had a life on 34 when he was put down by Shane Warne at first slip off McGrath. Warne got his left hand to the low chance but the ball did not stick. Fall of wickets: 1-4, 2-6, 3-92. Australian fast bowler Glenn McGrath was officially reprimanded for his behaviour during the third cricket Test against South Africa at the Sydney Cricket Ground today. Cricket Australia (CA) said McGrath had been reported by ICC field umpires Aleem Dar and Billy Bowden and third umpire Bob Parry for a Level 1 offence 1.4 under the International Cricket Council's code of conduct. That includes “using language that is obscene, offensive or insulting and/or the making of an obscene gesture.” It was his sixth disciplinary hearing in eight years but it was the first time he had been reprimanded for his behaviour during a Test match. CA said the incident took place at the end of the 13th over of South Africa’s second innings today. A hearing took place after the play involving ICC match referee Chris Broad and umpires Bowden and Dar along with McGrath, Australian captain Ricky Ponting and team manager Steve Bernard. McGrath has been fined four times and suspended once in his previous five disciplinary hearings, stretching back to 1998. Right arm spinner Rajesh Sharma was the wrecker-in-chief by claiming five wickets of Andhra, who resumed at 79 for two in reply to Punjab score of 316, and folded up at 237. The visitors were 98 for 3 at close. Overnight batsmen Prasad and Rao took the onus on them and batted with caution to build the score bit by bit gathering runs in singles and twos. The duo added 146 runs for the third wicket before Prasad was dismissed by Rajesh Sharma after a patient 72 which was the result of his 212 ball effort at the crease with the help of six hits to the fence. Skipper Venugopala Rao was a bit more enterprising as he hit 78 runs in a space of 178 balls and struck ten fours before being caught leg before wicket by his Punjab counterpart Dinesh Mongia. The two batsmen were out with in eight runs, opening the floodgates as Rajesh Sharma and Dinesh Mongia ripped through the middle and lower order to bundle Andhra out in 95.4 overs and take a comfortable 79 run first innings lead. Dinesh Mongia ended up with impressive figure of three wickets for 49 runs off 26 overs of which five were maidens. The five-time Grand Slam winner was struggling at a break down in the first set before leaving the court for 11 minutes of treatment to her left hip. But Williams, who had not played since pulling out of the China Open in September with a knee injury, broke the teenager three times in a row on her return. It was a cruel turn of events for Mirza (19), who had capitalised on some erratic serving to break Williams in the first game at the exhibition tournament. The 35-year-old American tennis great, an eight-time Grand Slam champion, sustained the injury playing racquetball with a friend last October and has not recovered in time to make the trip to Melbourne for the Australian Open, which starts on January 16. In a three-set thriller, the Croatian, fresh from leading his team to its first ever Davis Cup triumph, played a solid game in the first set, lost ground midway, before recovering well in the decider to post a 6-3, 3-6, 6-3 win in little over two hours to seal his place in the last eight. In the outside courts, Rainer Schuettler became the second seeded player to crash out of the tournament when he met his match at the hands of 102-ranked Kristof Vliegen of Belgium. Sanaa, who is ranked 196 as per latest ITF Junior rankings, displayed her prowess with her deft volleys which proved detrimental for her opponent, second seed Julia Glushko. The singles semifinals were played in thick fog and even lights were switched on for proper visibility. Rupesh Roy defeated countryman and fourth seed Akshay Bajoria in straight sets 6-3, 6-4. Rupesh will now meet third seed Ivan Anikanov of Ukraine in the final tomorrow. Anikanov reached the final after his rival and second seed Sumit Parkash Gupta retired after losing the first set 1-6. The girls semifinal played between Sanaa Bhambri and Julia Glushko of Israel lasted for 90 minutes and saw a seesaw battle. After winning the first set 6-0, Sanaa went down 0-6 in the second. But she won the third set 6-3. After the first set, it appeared as if she would sweep Glushko in the next set. But the reverse happened. Glushko took revenge by not dropping a single game to square the score. Sanaa was broken in the third game of the third set as she double faulted. But soon she regained her form and broke Julia Glushko in the fourth game. Sanaa then broke Julia at love to gain a 4-2 lead. Results (semi-finals): boys singles: 1-Rupesh Roy (India) b 4-Akshay Bajoria 6-3, 6-4; 3-Ivan Anikanov (Ukraine) b 2-Sumit Prakash Gupta (India) 6-1 (retired). Girls singles: Zhou Yi Miao (China) b Zhou Ni (China) 6-3, 6-2; 4-Sanaa Bhambri (India) b 2-Julia Glushko (Israel) 6-0, 0-6, 6-3. Boys doubles: 1-Rupesh Roy and Parkash Gupta (India) b Ashwin Vijayaraghavan and Gursher Harika (India) 6-2, 6-2; Wu Chen-Yu and Li Jie (China) b 2-Kishuk Sharma (India) and Ivan Anikanov (Urk) 6-2, 6-7(5), 6-2. Girls doubles: 1-Sanaa Bhambri (India) and Ksenia Palkina (Kgz) b Wang Wen-Bo and Liu Chang (China) 7-5, 6-4; Zhou Yi-Miao and Guo Xuan-Yu (China) b 3-Julia Glushko and Nadine Fahoum (Isr) 6-1, 6-3. Credible performance by goalkeeper Adrian D’Souza and defender Vikram Pillai enabled star-studded Indian Airlines overpower Indian Oil Corporation (IOC) 5-4 in sudden death stage in the final of the 22nd Indian Oil Surjit Hockey Tournament. 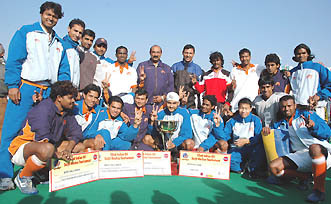 This is Indian Airlines’ maiden title win in this prestigious tournament. Deepak Thakur got the best player of the tournament award. The nail-biting tie began at a slow pace as both teams were into saving the goals rather than scoring. However, the match went into overdrive as Arjun Hallappa of Indian Airlines scored the first goal of the match in the 19th minute of the game giving his team the lead in the first half of the match. In the second half Indian Airlines appeared to be at the receiving end and the IOC forward line succeeded in mounting pressure by making repeated offensives in the rival penalty area. In the process they got a penalty corner in the 41st minute but rival goal keeper D’Souza made good save. However, in the 54th minute Olympian Deepak Thakur made no mistake in sounding the board on a penalty corner to level the score(1-1).There after both teams tried to score but defenders of both sides also played well to avert any possibility of a goal. Both teams also stood even at 3-3 in the penalty shoot-out and therefore sudden death rule was invoked. First opportunity was with the IOC but Didar Singh’s push was stopped by Indian Airlines goalkeeper D’Souza. Vikram Pillay made no mistake in landing his penalty push in the goal and concluding the match in his team’s favour. The best forward award was given to Sarwanjit, best halfback award went to Prabodh Tirkey, best fullback award went to Duleep Tirkey, best goalkeeper award went to Adrian D’Souza and best fair play team award was given to the Surjit Hockey Academy. Dhanraj Pillay roared on the very first day of the Premier Hockey League (PHL) when he steered Maratha Warriors to a splendid 2-1 win over defending champions Hyderabad Sultans in a Tier-I match of the PHL played at the floodlit Sector 42 Hockey Stadium today. Dhanraj was declared lion of the day by the sponsors. Dhanraj was in superb form throughout the match. Later, he said he wanted to show the world that he was still fit and could play at the highest level. He was the crowd favourite as he dazzled hockey fans by his stickwork and skills. The skipper of Hyderabad Sultans, Dilip Tirkey, said they could not play according to their game plan especially in the first half. Earlier, Shivender Singh opened the account for the winners in the 16th minute. Then in the 43rd minute, Hemant Ghethe made it 2-0 when he scored off a Dhanraj pass. The half-time score was 2-0. In the dying minutes of the match, Devender Pal Singh of Sultans reduced the margin with a field goal. Maratha Warriors will now play their next match against Sher-e-Jalandhar on January 7, while Hyderabad Sultans will play their next tie against Bangalore Lions tomorrow. Riding high on a fine display by their forwards, Orissa Steelers beat Delhi Dazzlers 2-0 in the opening match of second edition of Premier League Hockey (Tier II group) at Hockey Stadium, Sector 42, here today. With this win, Orissa Steelers, participating for the first time in the league, earned three points. Earlier, both the teams started on a cautious note. Steelers forwards Cyprian Aind and captain Sunil Ekka wasted two good chances in the first ten minutes of the game. The first goal came in the 14th minute when Rajesh Chauhan scored off a pass from Sunil Ekka. The Steelers captain Sunil Ekka converted a penalty corner in the 65th minute to score the second goal. Tomorrow, Chennai Veerans will vie with Lucknow Nawabs at 2.05 pm. On day one, Punjab State Electricity Board (PSEB), taking the field with at least half a dozen freshly recruited players in their ranks, snubbed Ropar Hawks 4-1 while in the second match, experienced Artillery Centre, Hyderabad, defeated Punjabi University, Patiala, 2-0. Earlier, the eight-day tournament, which has been accorded grade ‘A’ by the Indian Hockey Federation (IHF), was inaugurated by the ADGP and senior vice-president of the IHF, Mr Chandrashekhar. A significant feature of the opening ceremony was the organisers’ decision to pay tributes to late Prof Gursewak Singh in whose memory this year’s tournament is being played. Floral tributes were paid by Mr Chandrashekhar in the presence of Dr Manmohan Singh, son of Prof Gursewak Singh and secretary of the Patiala Union Hockey Association (PUHA) and Mr G.S Bains, president of the Liberals Organising Committee. PSEB now square off against Eastern Railway, Kolkata, while Artillery Centre will take on SSB, Gorakhpur. In tomorrow’s other fixtures Patiala-based Centre of Excellence will cross swords with BEG, Roorkie, while Thapar Academy will take on Jagraon Police. In the hardline match of the men’s section, PSEB, Patiala, downed Sangrur 25-14, 25-17, 25-17. Earlier, Punjab Police beat Sangrur 25-13, 25-13, 25-07, while BSF downed PSEB 25-18, 25-19, 25-21 in the semi-final matches. In the women’s section, Patiala downed Ludhiana 25-16, 25-19, 25-18 to clinch the title. Bathinda took the third spot by beating Amritsar 20-25, 25-27, 25-14, 25-18, 25-18.